Once our detailed diagnostics and planning is done, the implant is inserted into the jaw bone in an outpatient procedure either under the effect of local or general anaesthesia or sedation. During an individually defined healing period of 4 to 12 weeks, the implant will grow in well with the bone. In the meantime, our patients receive a quality denture. 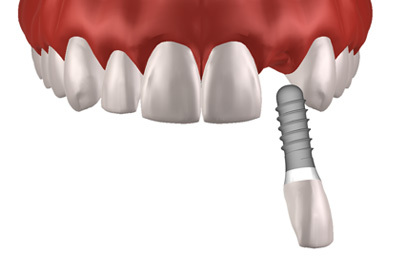 After the healing process, the implant works just as an articial tooth root serving as a secure basis for fixation of the new teeth - coronas, bridges and prostheses. Just as natural teeth, implant-supported teeth transport chewing pressure to the jaw bone causing healthy stimulation. Implant-supported teeth look just as your own. They are adapted on colour and shape to the surrounding teeth and fit in harmoniously. The vantages speak for themselves: high wearing comfort, unlimited chewing functionality and natural sensing of tastes. The longterm result of such an implant-based solution depends immensely on your oral hygiene. Regular check-ups and professional tooth cleanings help maintain your teeth and implants healthy.